Sturdy trailer for the transport of your livestock. 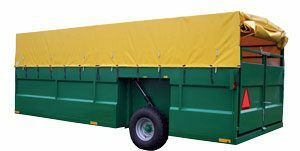 The trailer can be lowered & raised hydraulically to facilitate easy loading / unloading of the livestock. Thus no ramps are needed, which makes the trailer useful both at the farm and in the field. The trailer is fitted with 22,5″ wheels and heavy duty lifting hydraulic lifting cylinders for use in the toughest environment. – The trailers is road-approved, with lights and brakes fitted. – Double tail-gate is standard, but individual fitting of gates and partitions is possible, just as individual colours are available.